Stanley Majewski, Donald MacRae, Eric Douglas, ?, Angus MacLeod, Dennis Scott, David Mackenzie, Andrew Pirie, John Macleod, ? Wendy Henderson, Florence ?, Sabina Stoltman, Ann MacDonald, ?, Isobel Robertson, Dorothy Shearer, Effie Angus, Emily Heggie, Shirly Henderson. This is not a Primary 7 class. I think it is a First Year class as there are lots of pupils from Alness and surrounding areas here. I would say it is Class 1B in 1965. In the second row, Susan Urquhart is extreme right and Linden MacLeod is second from the right (beside her). Front row, second from the left is Florence Simpson. This is quite right Annella as I can't see yourself or my sister (Anne Maclennan) or any of her friends in this photograph. Third row: 4th left - Fraser Gibb? 3rd row right beside John Macleod is Brian Marshall. 2nd row beside Carlotte Leat is Carolyn Simpson then Rosalind Sangster, Ruby Mackenzie, Sandra Patience, Linden Macleod and Susan Urquhart. 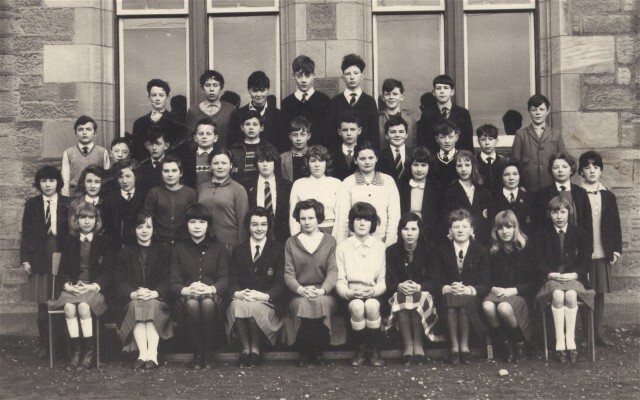 This was class 1B Invergordon Academy and the year was 1964 as I was twelve years old. 2nd row of girls and next to Margaret Mackenzie is Alison Bews not Buns. Front row next to Wendy Henderson is Florence Simpson and the girl in the middle of the front row is Elizabeth McWhirter. Just found my brother in this, John Macleod. Can't wait to see his face when he sees this. This is class 1b. 1965 is the year and I am in the photo - my name is Stan Majewski. Hi, it is great to see all your faces again. Oh the good days!! I am now living in Cambridgeshire Stan Majewski. I still come home every year.